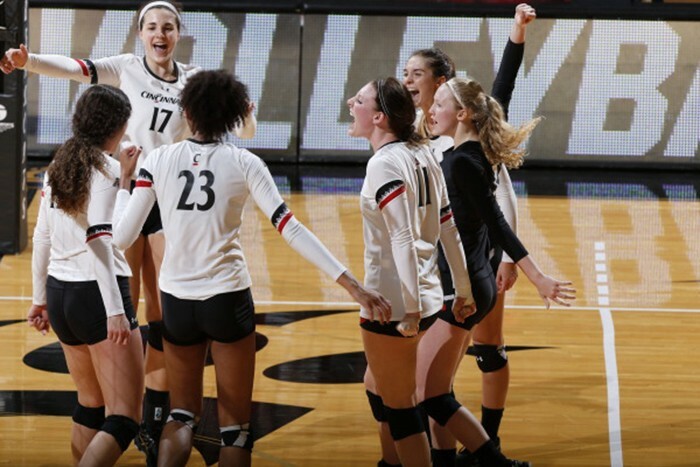 Cincinnati volleyball is back in the NCAA Tournament for the first time since 2011. Olympic sports––especially those played by women––never get the love that college football and basketball do. While I understand why women’s volleyball isn’t the talk of the town in an ESPN-driven sports world, it’s still important to recognize success when it’s right under our noses. The women’s volleyball team is tearing through conference play, and it’s pretty incredible. The Bearcats beat USF in a 3–0 sweep Sunday, improving their record to 5–1 in the AAC, which is good for a share of first place. The two teams deadlocked with UC are SMU and Temple, the conference’s top two finishers ahead of last year’s third-ranked Bearcats. The ladies are holding court (pun intended) with the best of the American, and it’s time somebody pointed it out. Since the start of conference play on September 14, UC’s only blemish is a 3–2 loss at the hands of SMU, last year’s AAC representative in the NCAA Tournament. That makes one narrow defeat (against a good team) to go along with a string of lopsided wins. Since that loss, the Bearcats have won 12 of 13 sets. I don’t know much about volleyball, but I know that’s a crazy accomplishment. This is a talented, well-coached group looking to win its first conference title since 2011. Try to make it out to a match, especially if you’re a student living in Clifton. It won’t cost you anything, and this team is fun to watch. They were picked to win the conference in the preseason coaches poll. If you like star power, a good place to start is with Jordan Thompson, 2015’s AAC Freshman of the Year and 2016’s AAC Preseason Player of the Year. She played on the U.S. Collegiate National Team this summer, and she is really good. The team has matches on Thursday at Houston and Saturday at Tulane. They return home on Friday, October 21 to face the UConn Huskies. Let’s some support for what’s currently the best team in Clifton. They’ve earned it.